We all dream of cooking in a Pinterest-perfect kitchen someday. You’d definitely never complain about making dinner if your kitchen had a huge island with granite countertops or a gorgeous farmhouse sink. It might seem like your small kitchen could never match your vision, but there’s hope! You can create a small-kitchen style you love even in the coziest spaces. The 7 tips and photos in this excerpt from Kitchen Ideas You Can Use by Chris Peterson will have you well on your way to finding a kitchen style that works for you—and your space. You’ll have the kitchen of your dreams before you know it! Bringing your own kitchen design vision to life entails many considerations— the room’s social uses, the practical aspects of how you prefer to prepare and cook food, the home’s overall design style—but none have a greater impact than the physical size and layout of the space. In fact, the dimensions of the room may actually lead you toward one design style or another. For example, modern designs are best suited to an open floor plan and larger spaces; informal country styles work well in more modest kitchens. You can spend a little more where there is less area to cover—such as the solid surface, tiered quartz countertop and top-of-the-line stainless steel appliances used in this galley kitchen. The counter material is stronger than granite and every bit as handsome. Designer stools and spectacular hanging light fixtures round out a look that is the very height of small-space sophistication. The triangle formed between the stove, sink/prep area, and refrigerator is the core of how efficient your kitchen will be. Experts call this the work triangle, and it should be as compact as possible to limit the number of steps you need to take from one area to the next. This compact kitchen includes an island sink that makes moving from food prep to cooktop as simple as turning around. Thoughtful layout like this is the key to any successful kitchen design, but is especially important in smaller rooms. Small, narrow kitchens require creativity to make the most of the limited space. The cabinets and countertops in this tiny room are narrower than standard, to allow for as much open floor space as possible. The stove, refrigerator, and sink are perfectly positioned in relationship to one another to ensure economy of movement in the room. Glass cabinet fronts make it easy to find exactly what you’re looking for. As this kitchen layout shows, a small space doesn’t necessarily need to be austere to be usable and welcoming. This cozy room uses a mix of open, vertical, and overhead storage to optimize every square inch. Although the kitchen appears to be jam packed, everything has a place, and it’s easy to find whatever the cook might need. It’s also a very homey look that seems both fun and comfortable. The lovely natural wood finish and simple lines of the wall and base cabinets, along with the timeless muted green of the island, help visually expand this modest kitchen. The same idea drove the choice of light pine for the flooring rather than darker oak or other wood, and bright white for the ceiling. It helps that the window has not been blocked by a window treatment and that the countertop surfaces are all light and bright as well. The unforgettable zebrawood countertop in this kitchen provides stunning visual patterns and a rich, deep finish, serving as a centerpiece that contrasts the understated cabinetry and walls. Because the surface only needs to cover a small area, the expense was kept to a minimum while the eye appeal is at maximum. Exotic hardwoods offer a range of exceptional looks and long-term durability, making them ideal choices for special surfaces. For more information about finding your kitchen style and transforming your space, check out Kitchen Ideas You Can Use by Chris Peterson. Inspiring designs and clever solutions for remodeling your kitchen. In the kitchen, functionality and aesthetics go hand-in-hand; the mood is just as important as the machinery, and if you’re looking to capitalize on the space in your home—no matter how big or small—you’re going to need a few pointers. The kitchen: command center of the home, headquarters for all things edible, family-member traffic funnel. Whether you’re a bachelor or bachelorette in a small starter home or part of a larger family, if this isn’t the most-used room in your house, you must not be home very often. In the kitchen, functionality and aesthetics go hand-in-hand; the mood is just as important as the machinery, and if you’re looking to capitalize on the space in your home – no matter how big or small – you’re going to need a few pointers. 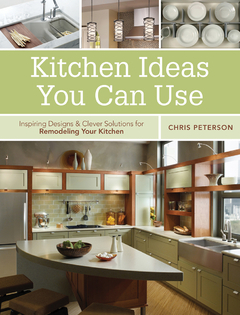 Fortunately, in Kitchen Ideas You Can Use, our home Do-It-Yourself expert Chris Peterson gives you a chapter-by-chapter breakdown of all the kitchen essentials: cabinets, countertops, appliances, flooring, wall treatments, storage, islands, eat-in areas, lighting, and ventilation. Kitchen remodeling is normally the most expensive home improvement project. But with over 300 inspiring photographs, Peterson’s straightforward insights, and our attention to the latest trends from professional designers, you can skip the cost of hiring a professional and craft your own kitchen–your own way. From choosing between traditional and induction cooktops to drawing up the most efficient layout scheme and landing on that perfect backsplash, Kitchen Ideas You Can Use might finally be the one thing in your house more useful than the microwave.